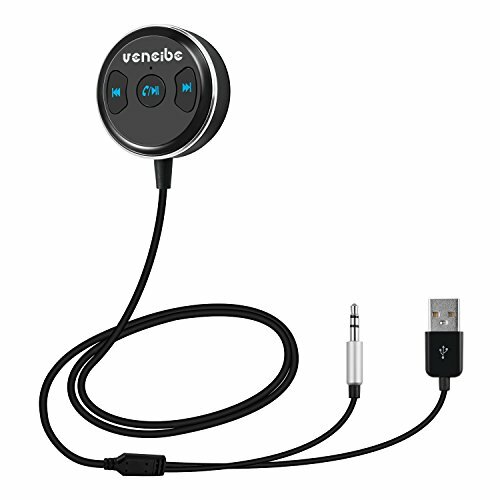 Veneibe sells Bluetooth receiver with bundling Ground Loop Noise Isolator, which helps decrease the buzzing noise some cars make while playing music, thus giving you the best music experience. 4.Backward compatible, no need to replace the chip. Bluetooth 4.1 technology allows for a high-quality wireless connection. Able to transmit sound and data quickly and reliably with no compromise on sound quality. Simple OperationThree buttons take care of all possible functions. Play and pause music, answer and hang-up the phone, skip forwards or backwards, even activate Siri and other voice control functions. 1.Vebeibe EK206 Car Kit powers on and off along with the ignition of the car. 2.Press & hold the Middle button for 5 seconds to turn Veneibe EK206 car kit on or off. Bluetooth CSR V4.1: With Bluetooth CSR4.1 wireless technology, transmission is more stable, and with noise reduction function; from any Bluetooth (A2DP) device seamless flow of music transmission. Hands-Free car kit；Compatible with Bluetooth enabled smartphone, Android, Apple iPhone 6 ,Apple iPhone 6 Plus, iGoogle Nexus, Samsung Galaxy, ipad, Tablets, other media players, and more! If you have any questions about this product by Veneibe, contact us by completing and submitting the form below. If you are looking for a specif part number, please include it with your message.